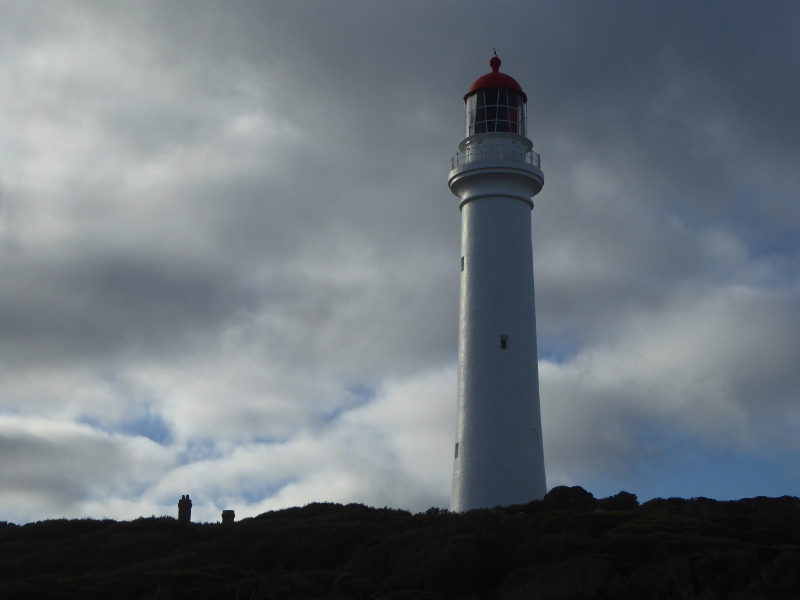 We spotted the red nose and sleek white neck of Split Point lighthouse as we drove west along the Great Ocean Road out of Anglesea. 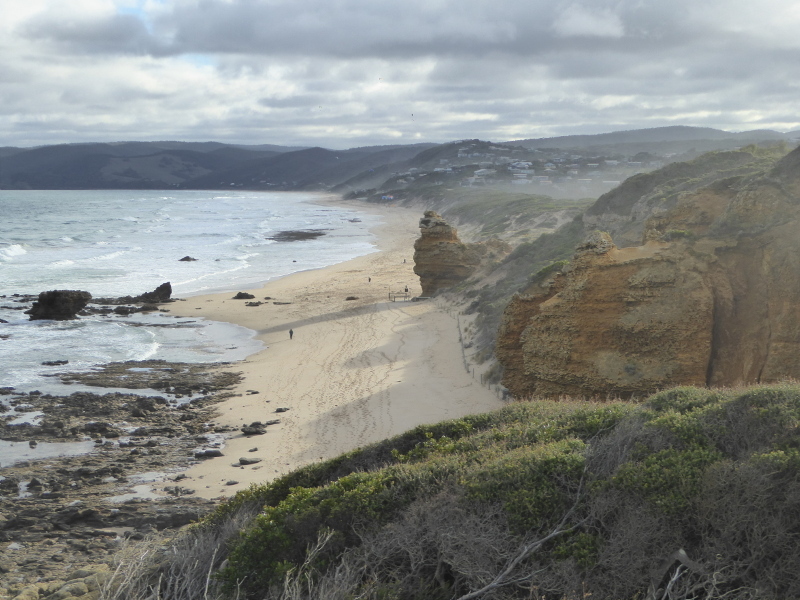 It disappears from view again and only really reappears when you get to Aireys Inlet, which is the nearest little town. 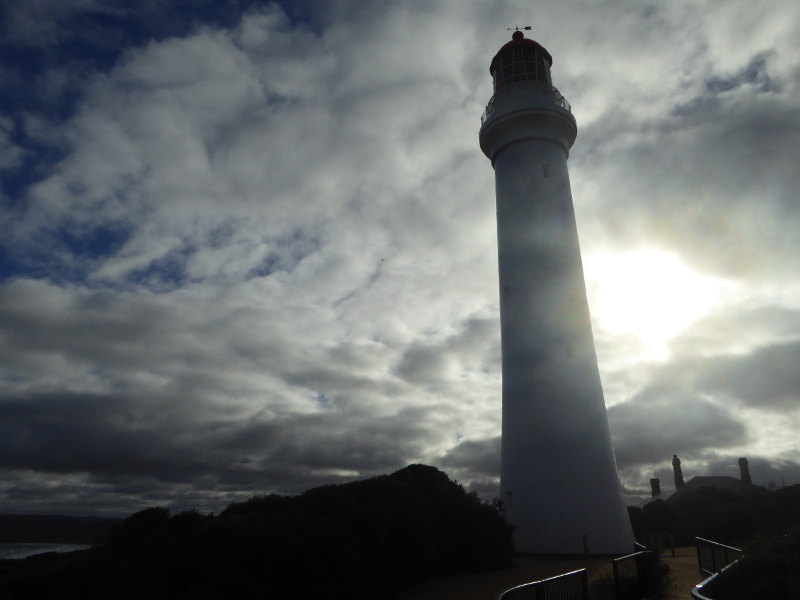 No wonder Split Point Lighthouse is known as the ‘White Queen’. She stands there so majestically, towering above the low shrubbery around the headland, looking down over the lovely formations of Sentinel Rock, Eagle Rock and Table Rock. And she is big. It’s not just the two metre thick walls, which give it a solid feel (no chance of the roof coming off this building, unlike the poor lighthouse keeper’s cottage 100 years ago – see history below), or the 135 steps up to the top. 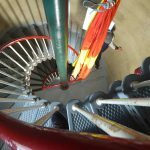 There may be a lot of steps up to the light itself, but they are wide and shallow so not a hard climb, and no chance of vertigo again since there are few vantage points on the way up and no need to look down the winding staircase if you don’t want to. 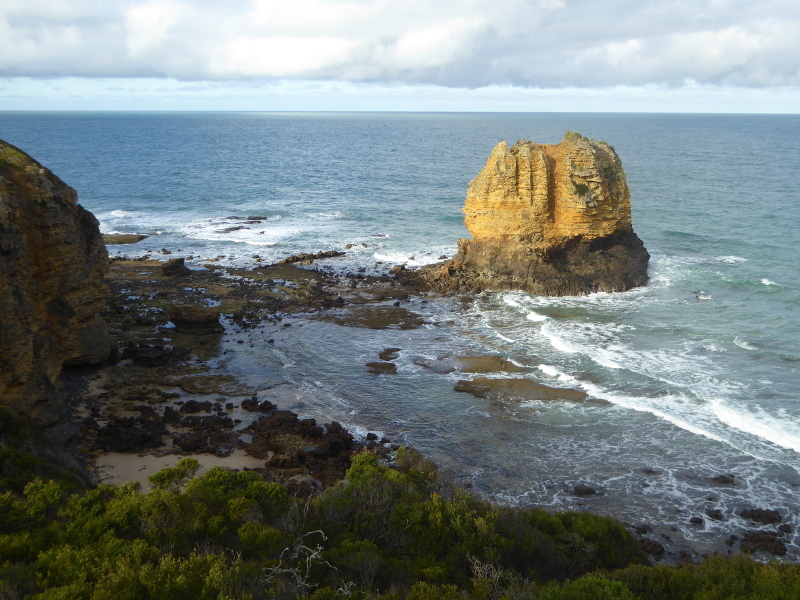 The guide told us of the reef about 300m off shore here at Split Point and the steep waves that form in the Bass Strait due to the swell hitting the continental shelf between Victoria and Tasmania. 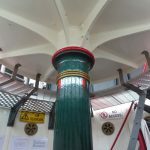 A popular story concerns Richard Baker, who apparently scratched a little hole in the black paint round the light so that he could sneak off to the local pub on quiet nights and still get a regular glimpse of the light to reassure him that all was well. 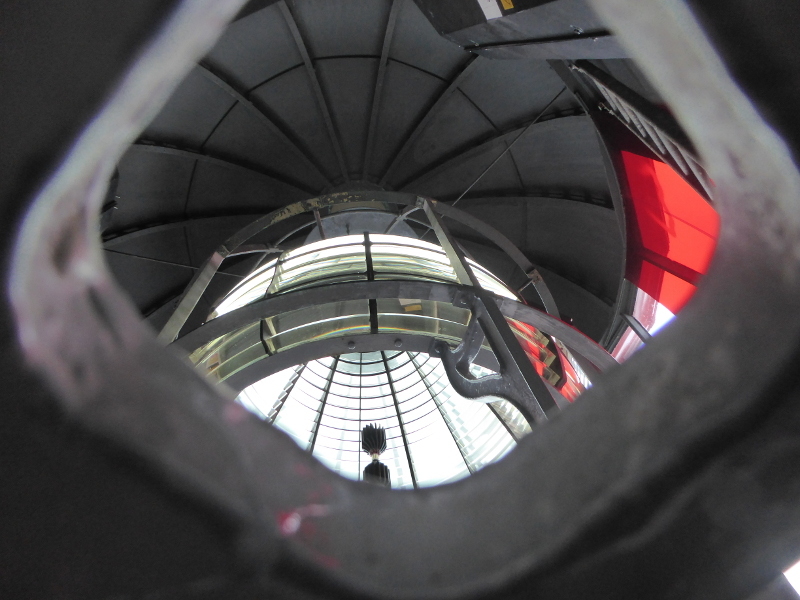 Up at the top, just below the light itself, it gets hard for someone as tall as me to stand up straight. This is the area, we were told, where the person on duty would sleep, though there wouldn’t be a bed as such. 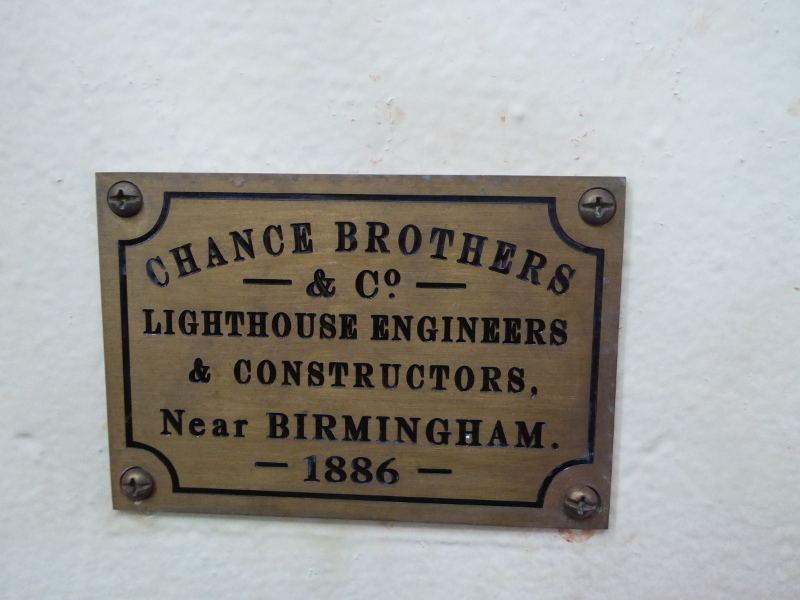 I liked the brass plaque of the lighthouse manufacturers – Chance Brothers near Birmingham, who shipped the materials out to Australia in 1886. Chance Brothers are responsible for the idea of different lighthouses having different rotating speeds to help ship captains determine where they were. The company is still going apparently, as a specialist glass maker based now in Worcestershire. 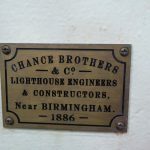 But there is also an Australian company which intrigued me.Chancebrothers.com is a Melbourne-based company of lighthouse engineers who work to restore and preserve the heritage of lighthouses. What a great notion. They even have a spare parts section! 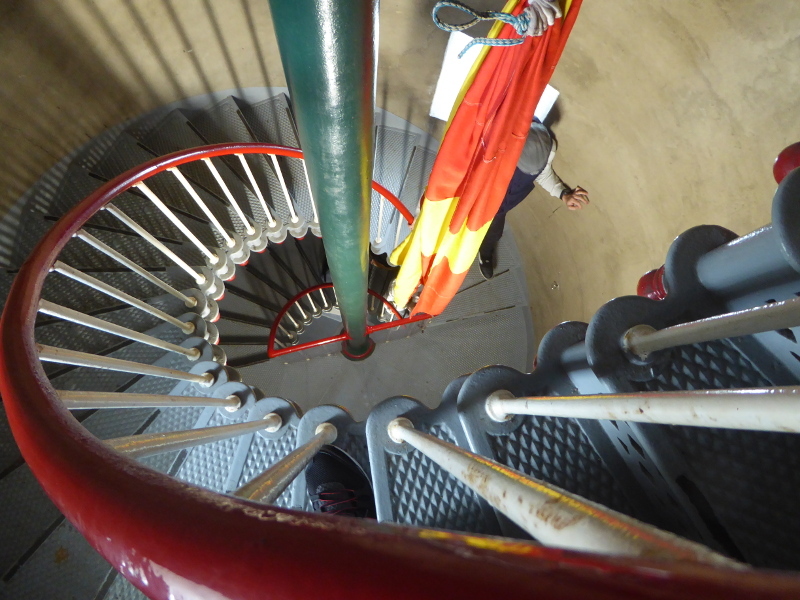 With the wind picking up, we weren’t allowed to go all the way round the fenced gallery at the top of the lighthouse. But even going half way round was enough for me. 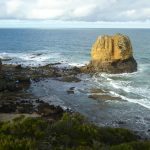 Fantastic views up there of the rock formations and the ocean waves – and I’m guessing if you’re lucky, the odd whale to be spotted. Turn left out of the door to look west along the beach and the coast; right to see the Eagle Rock. 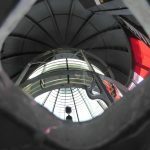 My vertigo made me hold firm to the side of the lighthouse rather than leaning over the fence for better views, but well worth the visit to the top. 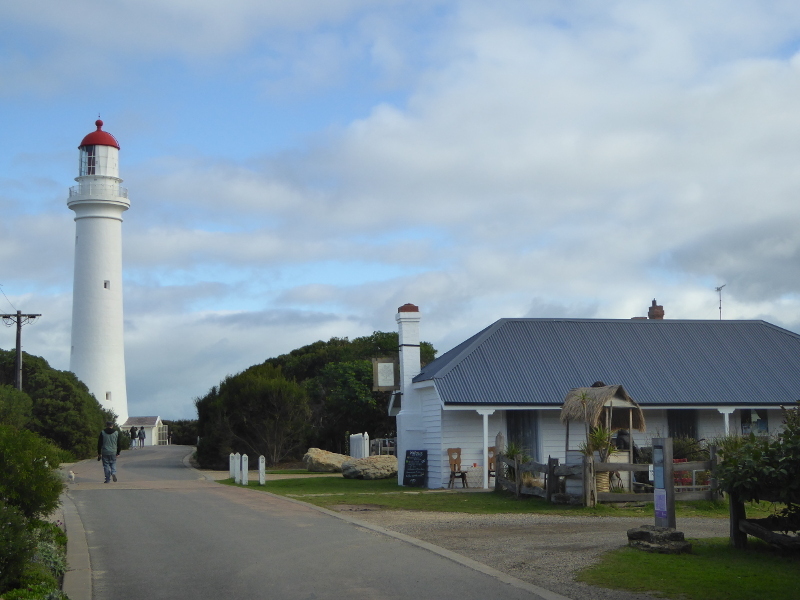 On the way back down, others in the group I had joined had gone online to find the signature tune of the ‘Round the Twist’ TV series from the 1990s, which was set in and around Split Point Lighthouse. There over 2,500 episodes, apparently! Car park about 200m from the lighthouse. You then walk along a path past the old keeper’s cottages and stables. 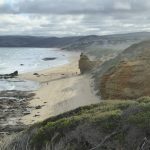 Public transport is possible: there are a handful of buses a day from Geelong to Apollo Bay (though only one practical bus a day on weekends), which stop at Aireys Inlet about a hour out of Geelong. A fascinating report in The Age of 22 May 1886 refers back to the wonderfully named Intercolonial Lighthouse Conference held in Sydney in 1873. 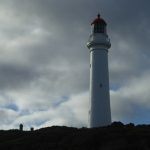 This conference decided on danger points where new lighthouses were needed, and Split Point gets a mention here as midway between Cape Otway and Port Phillip as a point where too many ship captains hug the shore as that makes it easier to pick up the existing light at Port Phillip Heads, but then they get caught in tidal swells and pushed onto reefs nearby. A Marine Inquiry held just a week after the light began functioning discussed a ship wreck which had taken place 6 weeks before. 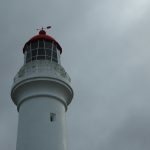 The big question in these cases was always whether the Master – or ship captain – was to blame, and for the question of the Buncoora, the Court was ordered to ignore the lighthouse since it had not been operational at the time of the wreck. But it was a case where an operating light might well have meant the ship kept well away from the shore. 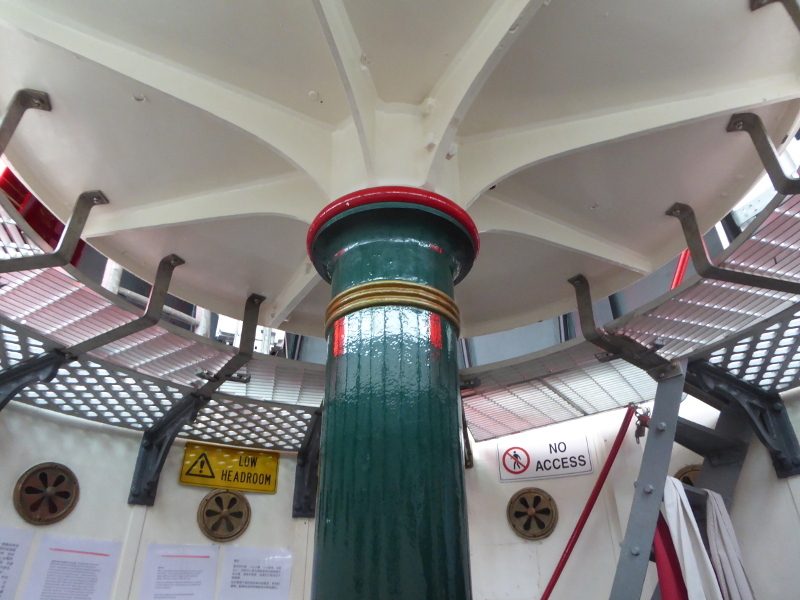 There was press coverage in 1903 of the inquiry into the Inverlochy shipwreck which showed just how important the technical side of the lights’ range and colours was. 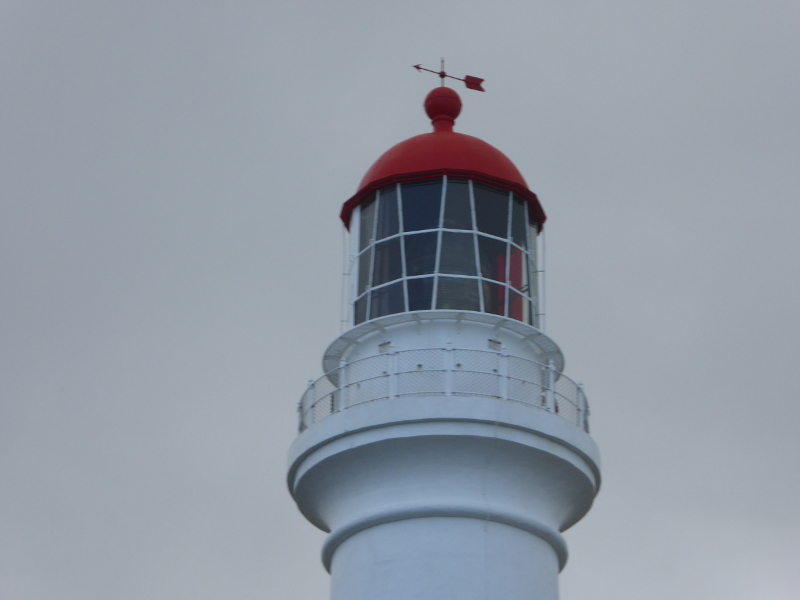 At less than three miles offshore the Split Point light was supposed to be visibly white rather than red. Interestingly, one witness – another ship’s captain – told the inquiry that he hadn’t realised the colour change happened as he always kept his distance from the dangerous coast here. March 1911 a storm blew the roof off the lighthouse keeper’s dwelling. 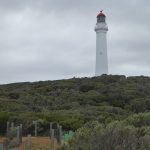 A September 1918 article in The Cobden Times writes of the Split Point Lighthouse appearing in a ‘cinema picture’ being made of the – then being built – Great Ocean Road. 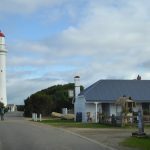 The film was to include ‘motor boating at Barwon Heads, surf bathing at Torquay – (surfing was also new then) – fishing at Anglesea and the Split Point Lighthouse.” Cinema was a novelty then, too, of course, and I rather liked the explanation: “It is estimated that the film, which will be over 2000ft long, will take half an hour to project on the screen.” – I wonder if anybody ever saw that film? Or whether copies were made? And do any bits of it still exist in some dusty archive somewhere? A short walk from the lighthouse westwards towards the beach and there is a cairn commemorating the place where the earliest settlers to the area are buried. 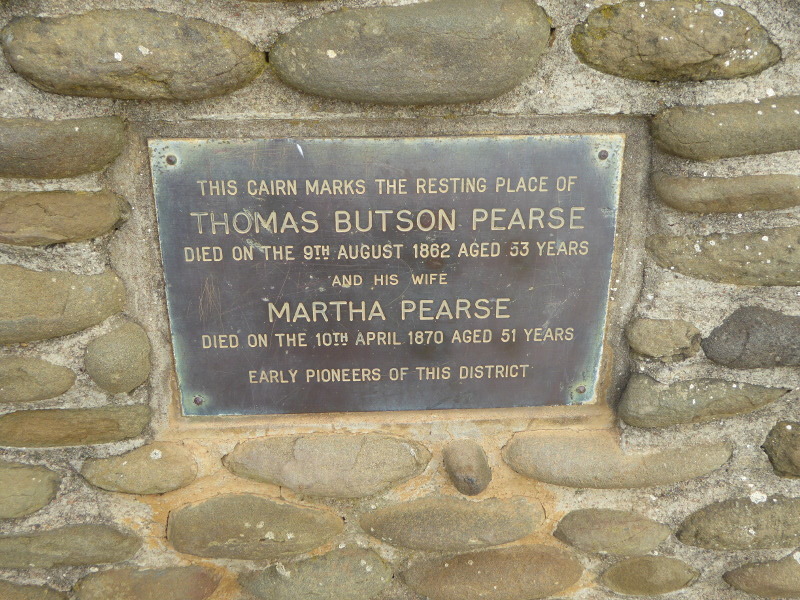 Very sadly, Thomas and Martha Pearse’s cottage was burnt down when bushfires ravaged the area around Split Point lighthouse in 1983. But the cairn is a nice reminder all the same. Back in 1919 the Geelong Advertiser reported on Easter visitors to Airey’s Inlet – don’t forget this was still years before the Great Ocean Road was built, so it was no easy place to get to. 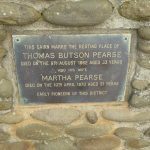 Mr Pearse and Mrs Beech were among the names listed. These were the children of the original settlers in the area. Mr Pearse – now a ‘prosperous Queensland squatter’ – had married a ‘charming English lady’ who was very taken with her husband’s birthplace. 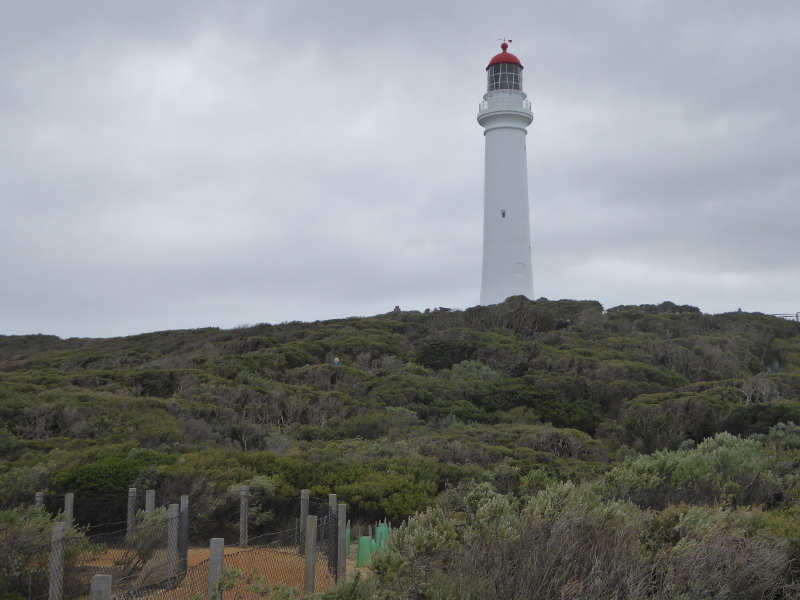 The burial place of the parents is ‘carefully and reverently cared for by the lightkeepers’ – The Pearses owned all of Aireys Inlet and land as far as Anglesea. 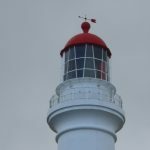 What are your experiences at Split Point lighthouse? Does anybody else have stories to tell of their own visits or escapades in and around Split Point? If so, I’d love to hear them, so send a comment in below. And if anyone knows anything about that film made in 1918, please share it here too. 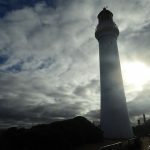 This ABC Radio Perth piece dates from 2011 but is still relevant and up-to-date, with some great pics. Chef Tonio has a very similar blogging style to mine. Check out his thoughts on Split Point Lighthouse. I love the concept of Hung up on Retro blog. 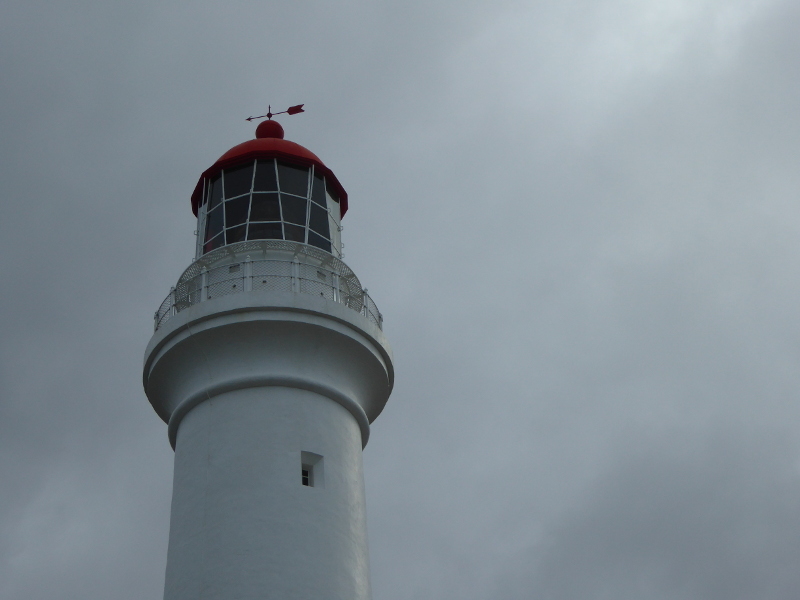 They focus as much on the tea rooms as the lighthouse (nothing wrong with that, either…). I liked the Mamma Knows West blog, too. And there are some great pics on this Rants from the Hollow blog. Cup of tea after your tour? The tea rooms right by the lighthouse are actually in the old stables building for the lighthouse keeper. The Willow Tea House was a great find, with fantastic home-baked cakes and loose-leaf tea. Seating inside or out and many of the tables outside cleverly placed to be out of those brisk onshore winds.